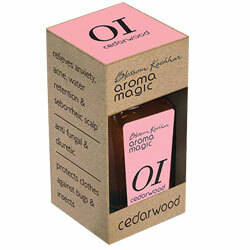 Aromamagic Cedarwood Oil Relieves Anxiety, Acne, Water Retention & Seborrheic Scalp. Protects clothes against bugs and Insects. Relieves anxiety, Acne, Water Retention and Seborrheic Scalp.